So because the diamantes on my previous mani fell of within a day, resulting in dear mum asking if my nail was broken, I decided to take it off. Bit of a shame it gave me a minor case of the smurf fingers! So I did another mani to cover up my blue tinted nails. I wore the purple OPI (Purple With a Purpose) as my pedi for year 10 formal and then it got shoved in the drawer and neglected. So seeing as I haven't worn it on my fingers, I classified it as unworn. 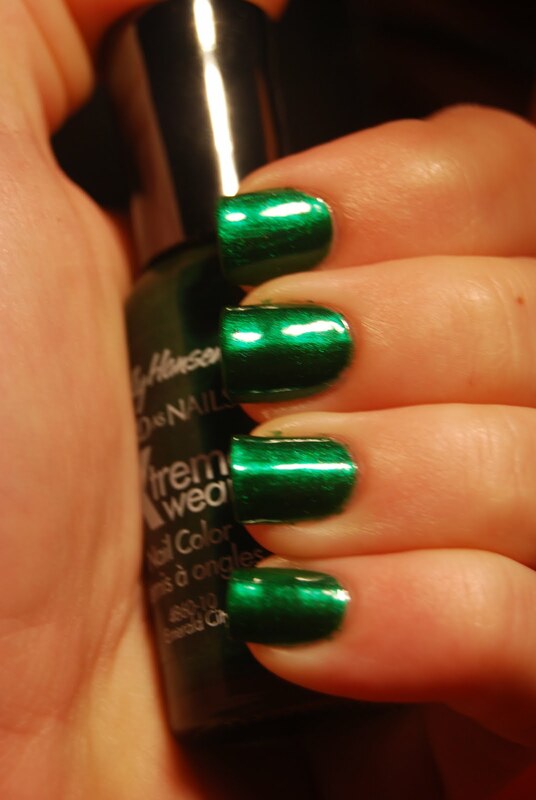 But seeing as it's May, I couldn't go past my birthstone shade :) So here's Emerald City! I can't believe i've never worn this before! It's definitely going into high rotation around Christmas time.So glossy and sparkly.. I might also try the Artform Green multichrome on top if I get bored with this mani as I did a one finger swatch over a black base and didn't like it very much. This was 3 coats of Emerald City over a OPI Original Nail Envy base with Revlon Colorstay Top Coat. So do you guys have the same problem of buying all these beautiful colours, sticking them in a drawer and then forgetting all about them? I'd love to know if you see anything you'd like me to swatch! !